Trattoria is an Italian restaurant located in Kitsilano on West 4th. It is part of the Glowbal Restaurant Group and it has a similar menu to the Italian Kitchen located downtown. Every Tuesday at Trattoria all of their pasta dishes are only $11. This is a pretty killer deal since most of them regular price are $15-$20. Since I am trying to make myself acquire a greater appreciation for pasta dishes, I came here for lunch on a Tuesday to take advantage of the deal. Since truffled spaghetti and meatballs was the most expensive item on the menu, naturally, it was the one I ordered. The portion is really large and it could easily be shared between two people. The meatballs were massive. I couldn’t even finish them all. The meat was tender and not overcooked, but also not overly juicy. I would have preferred them to be slightly more juicy, but they were by no means bad. The meatballs are topped with a tomato basil sauce, which had a nice flavour to it. The truffled spaghetti was really good. The truffle flavour was mild and not too overwhelming. The sauce was very creamy and rich. The dish was also topped with a big dollop of herbed ricotta cheese. I don’t know if I would ever pay $23 for this dish on the regular priced menu, but for $11 it was a great deal and super filling. Trattoria has a nice and bustling ambiance and it is definitely worth checking out on Tuesdays. Yes, for $11 pasta Tuesdays. 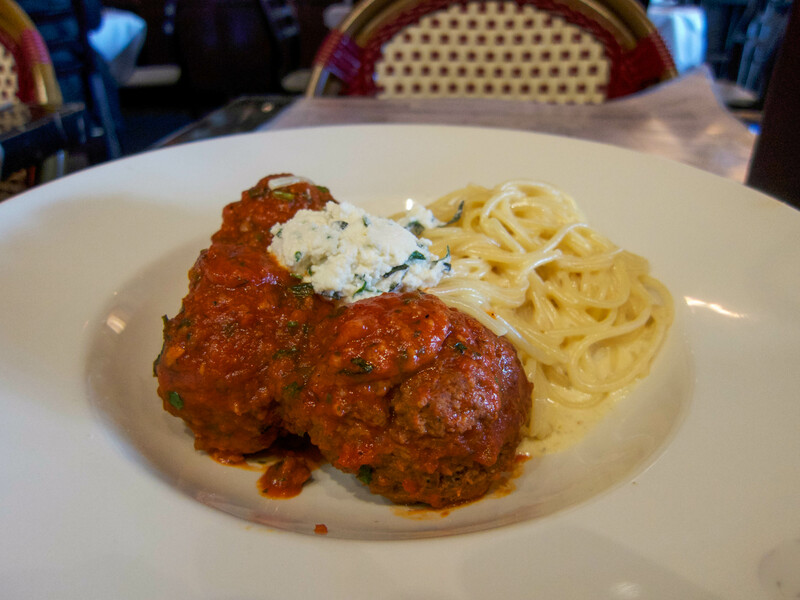 Haven’t visited Trattoria yet, but that meatball dish looks delicious. Likewise, I’d be ordering the most expensive dish, too. Go big, or go home! It is definitely great value and worth checking out on Tuesdays!